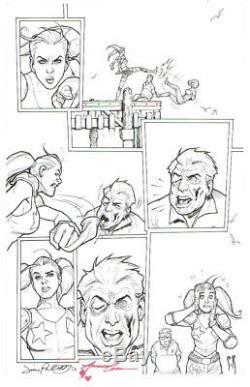 A beautiful page of 2014 Harley Quinn original art by stellar comic book artist Stephane Roux! This is the original art to Harley Quinn # 4, page 16 and features Harley Quinn & the Rubenstein family. 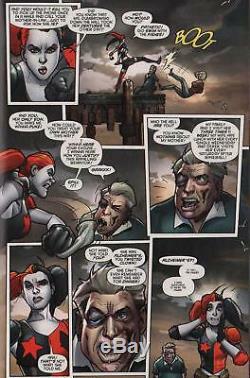 On this page: Harley kidnaps and terrorizes the Rubenstein family for not visiting Mr. Rubenstein's mother in the nursing home--until she finds out that that his Mom has Alzheimer's! Oops, coulda happened to anybody, right?? See color scan of published page for more. The art on this page was penciled and inked by Stephane Roux! Stephane, along with Harley Quinn writers Amanda Conner & Jimmy Palmiotti, have all signed the art on the bottom of the page! PLEASE NOTE: This is an original, hand drawn piece of published Harley Quinn art, not a print, copy or facsimile! This 11 X 17 inch page of art on bristol board is in excellent condition and would make a great addition to any Harley Quinn, Stephane Roux, Amanda Conner or Jimmy Palmiotti collection! It could also make a GREAT GIFT! These charges are the buyers responsibility. And, check out my other auctions for great original comic book art! The item "HARLEY QUINN ORIGINAL ART-SIGNED STEPHANE ROUX, AMANDA CONNER-FREE SHIPPING" is in sale since Thursday, November 30, 2017. This item is in the category "Collectibles\Comics\Original Comic Art\Interior Pages". The seller is "stevo861" and is located in Fort Lauderdale, Florida. This item can be shipped worldwide.